A group of tenants at Milstein Family Condominium Conversion 30 Lincoln Plaza has filed a lawsuit against the sponsor and the attorney general, claiming a “fire sale” of units in the building resulted in an “egregious miscarriage of justice” against tenants. Facing a December 2008 deadline for the offering plan to be declared effective, Milstein slashed prices for non-tenants, selling units for 40 to 60 percent less than the prices tenants had paid, according to the suit, filed Dec. 21 in New York State Supreme Court. 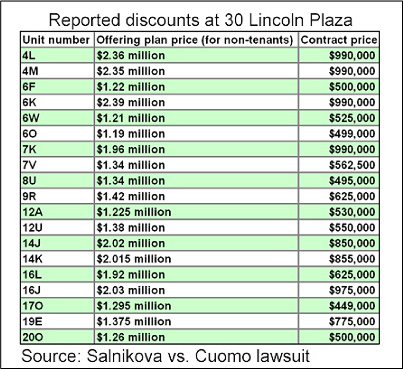 The suit, which reveals the “vastly reduced prices” of units in the building (see accompanying chart), offers a glimpse into the challenges faced by developers after the financial crisis of 2008. In the suit, tenants asked that the attorney general rescind the approval of the amendment that declared the plan effective. The suit was filed by tenants Vera Salnikova and Scott Petepiece, and an unspecified number of members of The 30 Lincoln Plaza Ad Hoc Tenants Committee. Located at 30 West 63rd Street between Broadway and Central Park West, 30 Lincoln Plaza is a residential building developed in the 1970s by longtime New York City landowners the Milstein family. In 2007, the attorney general’s office accepted a condo conversion plan for the building, which at the time had more than 500 rental units. According to court documents, the plan gave rental tenants a limited amount of time to purchase units in the building for 25 percent less than the market value of each unit as listed in the plan. From the outset, tenants in the building felt the prices were unfair, the suit says. “Many tenants in the building were concerned that even with the 25 percent discount, the prices being asked by the sponsor were high and sought assurance… that the non-tenant prices listed in Schedule A of the plan were reasonably representative of true market prices for the units,” the suit says. A total of 45 tenants entered agreements to buy their units during the time allotted, though two later backed out, the court documents say. During that time, “not one non-tenant had purchased an apartment in the building,” the suit says. Rather than increasing, non-tenant prices allegedly decreased. According to the plan, the sponsor was required to sell at least 87 units in the building before Dec. 17, 2008 in order for the plan to be declared effective. To facilitate that, the sponsor’s selling agent approached various brokers in September 2008 and asked them to find buyers at “vastly reduced prices,” the suit says. For example, the suit says, Apartment 6k was priced at $2.39 million in the offering plan, but went into contract for $990,000. Unit 12U was priced at $1.38 million in the plan, but went into contract for $550,000. Unit 9R, listed at $1.42 million, was sold for $625,000. By October, a number of apartments had been sold for prices 45 and 60 percent below the prices listed in the plan, according to court documents. A total of 123 units were sold by the time the plan was declared effective — 80 units to non-tenants and 43 to tenants. The suit claims that the sponsor violated the terms of the offering plan by selling non-tenants apartments at lower prices while forbidding tenants from receiving equivalent discounts. Because the tenants were not offered the opportunity to have the prices of their units reduced to similar levels, they were discriminated against, the suit claims, and sales that constitute “discriminatory inducements” should not be counted toward declaring a plan effective, the suit claims. The tenants also claim that brokers, including Halstead’s Michelle Kim, and Bellmarc’s Lor Gozum, and Oren Shalev at Anchor Associates, purchased units in their own names, though the brokers were not named as defendants in the suit. Those sales should not have been counted towards the minimum number as “bona fide sales” necessary for the offering plan to be declared effective, the suit claims. Shalev confirmed that he sold several units in the building and bought one for himself, a common practice among real estate brokers. He said the tenants involved in the suit are simply angry that they bought at the height of the market. Gozum and Kim declined to comment. Salnikova unsuccessfully sued the sponsor in May of 2008, claiming to be a rent-stabilized tenant and therefore had the option of remaining in the apartment if she decided not to buy it. The court ruled that Salnikova’s apartment was no longer rent-stabilized. The attorney for the tenants, including Salnikova, Richard Farren, did not respond to calls for comment by press time. The 2009 suit also claims that because some tenants purchased units in the building at non-tenant prices in the names of family members, all tenants should have been allowed to purchase at the lower prices. For example, Unit 8C was purchased by the husband of the tenant at Apartment 30E for $825,000, some 56 percent below the price listed for non-tenants in the plan — $1.88 million. Because the husband had been an organizer of a tenants’ committee in 2007, the sponsor should have been aware that he lived in the building, the suit says. The tenants took their complaints to the attorney general’s office, which determined that the sponsor was within its rights in filing an amendment that would reduce prices for non-tenants, but not tenants, the suit says. The sponsor agreed to pay $100,000 to the attorney general, an outcome that did not satisfy the tenants. Details about the payment were not clear at press time. “Instead of protecting the tenants in the building, the AG has used the occasion to collect money for the state,” the suit says. The attorney general’s office did not respond to calls for comment. The suit suggests that the decision may have been influenced by the fact that an assistant attorney general had “a longstanding friendship and mutual respect” with the counsel for the sponsor. The suit also claims that the sponsor harassed tenants into vacating their apartments, and that buyers weren’t made aware of material risk factors, such as the fact that the building exceeds the size listed on its certificate of occupancy. Finally, the suit claims that the sponsor retains more than 75 percent of the units in the building, making it hard for buyers to finance purchases in the building. 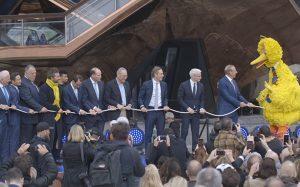 A large number of units have since been rented out by the sponsor, sources confirmed.